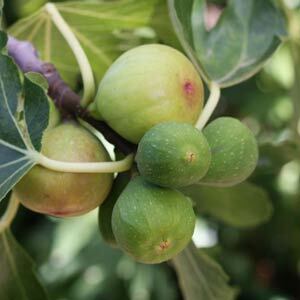 Fig Trees are readily available for sale from online and retail nurseries, they are a hardy drought tolerant tree once established. Originally from the Mediterranean figs grow well in many areas of Australia. A hardy tree once established fig trees not only provide wonderful fruit but with great foliage are an asset for this reason alone. Figs trees can be grown in the ground, in pots and can even be grown as a fruiting hedge. When growing in pots try to keep the pot size small and ‘pot up’ as required, fig trees seems to fruit better with a restricted root run. In warmer climates fig trees can actually produce two crops a year. Mulch each year to maintain a cool root run, some well rotted compost and aged sheep or cow manure can also be added. Water fig trees to keep moist in summer, but not wet. A monthly watering with a liquid seaweed fertilizer is beneficial. Fig trees have a fairly shallow root system so try not to disturb it by digging around the tree. As the fruit begins to ripen in from summer to autumn, its time to cover the trees in bird netting, otherwise the birds will beat you to the figs. This is also the time to make sure that the soil does not dry out. One problem with figs is fruit drop, and dry soils while the fruit is ripening can cause this. Fig trees need very little pruning, usually they can be left for 3 – 4 years before shaping if required. Newly planted trees can be cut back to reduce transplant shock but this is not generally needed unless you are transplanting an established fig. Fig trees can also be espaliered to ‘save space’ a fan is the usual shape. Over time, Fig trees can grow to around 7 metres (20 feet) in height, however in most gardens they are pruned to a smaller size. The branches are easy to prune as the wood is fairly soft. With a number of fig tree varieties including White Genoa and Black Genoa, available for sale to the home gardener, type of fruit, tree size and ripening time all need to be considered when purchasing a fig tree. Popular varieties include Brown Turkey, an early ripening fig that does well in drier areas and Black Genoa, a prolific fruiting tree. A fast growing heavy cropping tree that produces large sweet purple skinned fruit. Grows well in cooler areas, yellow green skin and a softer taste than many figs. Useful as it crops over a long period commencing early. Large fruit that are sweet. Very hardy tree that does well in inland areas. Does well in warmer areas, good fruit for jam. A black skinned fruit from a heavy cropping large growing tree. Orange flesh. Fruit is green to yellow with very sweet flesh. A large fast growing tree. So which is the best fig tree to grow, ‘White Adriatic’ and ‘Black Ischia’ are probably two of the best tasting, however the second one it is not grown widely commercially as it does not transport that well. ‘Brown Turkey’ is one of the best ‘all round figs’ it is early and grows well in drier conditions, great for Perth. The ‘dwarf brown’ is excellent for containers and smaller areas, it only reaches around 2.5m.